How Will Detained Children Find Their Parents? Donald Trump has aborted his controversial family separation policy, but now immigrant advocates are struggling to track down the parents of the 2,300 immigrant kids already in federal custody. Government records are reportedly missing vital identifying information, such as name and age. The Department of Homeland Security officials who took children from their families sometimes did not collect enough information to locate their parents, or didn’t include it in the children’s files, say non-profit and religious groups that provide help to detained immigrant children. In some cases, children were filed under incomplete or incorrect names, or were listed only by their nicknames. This is a problem, since some of the children the Department of Homeland Security officials is taking from their parents are too young to identify themselves or their family. Others may only speak indigenous languages. 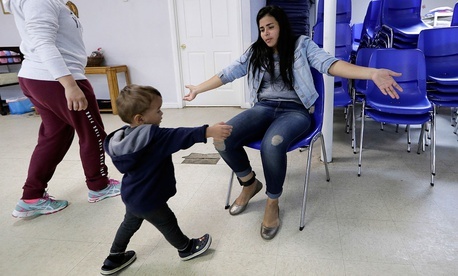 Michele Brané, who runs the migrant rights program at the Women’s Refugee Commission, encountered a girl at the Border Patrol’s processing station in McAllen, Texas, whose name and age were wrongly recorded. After extensive sleuthing at the facility, she found the girl’s aunt and discovered she was four years old instead of two. “I don’t know how many others like that there might be out there,” she said during a conference call with reporters. Another problem advocates have come across, they said, is the lack of information to match the case of a detained child to the case of a detained adult. Ashley Feasley, policy director at United States Conference of Catholic Bishops, which provides foster care for immigrant children, says sometimes authorities don’t tell the group how many of the children it’s caring for have been separated. Piecing together the limited and sometimes inconsistent information is not unlike the work of a private investigator, said Wendy Young, president of Kids in Need of Defense, a non-profit that provides legal help for immigrant children, who was also on the call. “It’s taking a long time,” she added. Only in the past few days have officials started assigning a shared ID number to all family members, the advocates said. The Department of Homeland Security did not immediately respond to a request for comment. Detained parents have been left helpless with no tracking information, while their children have been flown to holding centers as far as Michigan and New York. The Office of Refugee Resettlement, which assumes care of the children after they are processed by the Border Patrol, provides little to no information to their parents, according to a federal public defender who represents them. The other federal agencies involved in the process are not much better, he told Slate. There appears to be no coherent policy… as to what it is they provide or don’t provide to these parents. It runs the gamut from—anecdotally, being in the field down here representing these folks—some get absolutely nothing, others have been told to call numbers, others have been given some paperwork about the now–immigration proceeding that their child will be a participant in. But there is no clear, straight answer to this. They could soon get help. Genetic testing companies 23andme and MyHeritage have said they want to use DNA tests to help reunite children with their parents. It’s inspiring to see the massive outreach around helping these families. 23andMe has offered to donate kits and resources to do the genetic testing to help reconnect children with their parents. We are waiting to see the best way to follow up and make it happen.